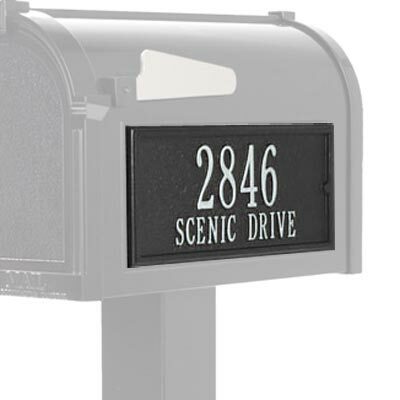 Display your house number beautifully using the Whitehall Black and Silver Personalized Mailbox Side Panel. This single panel is specifically designed to fit onto your existing Whitehall Black Deluxe Mailbox (not included), adding an elegant accent to your curb. The black color and silver hued characters enhance your yard, and the item can be personalized with up to five 4.5" characters on a single line. For more versatility, the panel can also accommodate two lines, with up to five 3" characters on the top line and up to sixteen 1.25" characters on the bottom line. Hand cast in recycled aluminum from a mold created specifically for your order, this panel will certainly display your customized information in a single, durable piece. Use the included hardware to attach this marker to the side of your mailbox in moments. Distinguish your mailbox using this Black and Silver Personalized Mailbox Side Panel. Made in the USA.